Three photographs document Akron native Judith Resnik's astronaut candidate training from May to August 1978. 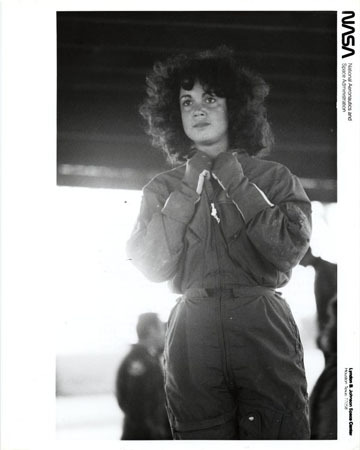 In the first photograph Resnik is preparing to simulate a parachute jump at Vance Air Force Base in Enid, Oklahoma. In the second photograph, taken in Homestead, Florida, Resnik is completing a water survival course, to prepare her for emergency ejection from an aircraft over water. In a third photograph, taken at Ellington Air Force Base in Houston, Texas, Resnik is shown training in a T-38 aircraft with pilot Dr. Richard A. Laidley. The photographs measure 8" x 10" (20.32 x 25.4 cm). Resnik (1949-1986) was born in Akron and graduated from Firestone High School. She earned a bachelor of science degree in electrical engineering from Carnegie-Mellon University in 1970, and a doctorate in electrical engineering from the University of Maryland in 1977. She began working at RCA as a design engineer in 1971 and was a biomedical engineer and staff fellow in the Laboratory of Neurophysiology at the National Institutes of Health in Bethesda, Maryland, from 1974 to 1977. She was selected as an astronaut candidate by NASA in 1978. During her first mission in space, Resnik and the crew of the Discovery became known as "Icebusters" by successfully removing hazardous ice particles from the orbiter using the Remote Manipulator System. Resnik was killed during her second mission on January 28, 1986 when the space shuttle Challenger exploded shortly after liftoff.